If you want to drive yourself crazy, here’s an exercise: Try to sort out which NFL draft prospects should be classified as defensive ends and which should be classified as linebackers. In many cases, it’s dependent on the type of defense a team uses as its base scheme – 3-4 or 4-3. As such, the classification of “EDGE” defenders has come in vogue. Simply, it’s those players who are primarily responsible for two jobs: Setting the edge against the run and, perhaps more importantly, rushing the quarterback. It’s a good year to find that type of player. 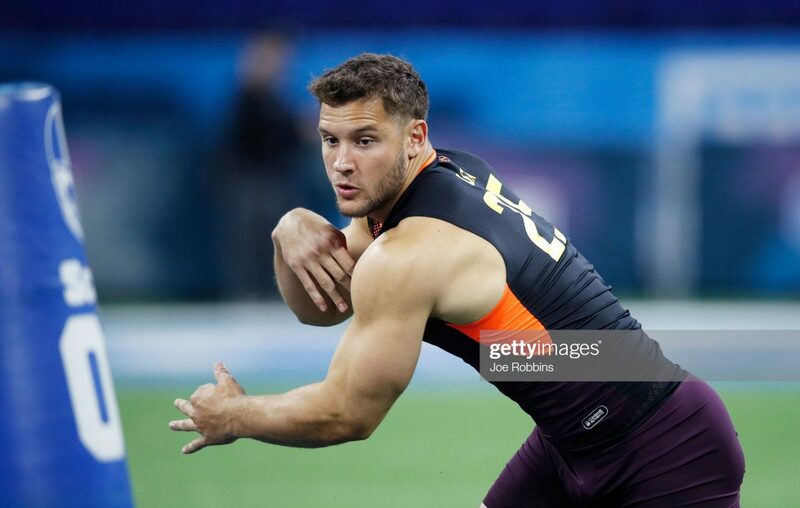 “Premier talent and depth at the defensive line position, inside, outside, it’s outstanding, and it carries deep into the draft,” NFL Network draft analyst Daniel Jeremiah said. Outside quarterbacks, the highest-paid players in the NFL are those who chase after them. The franchise tag value for defensive ends is $17.1 million, which is the second highest behind only QBs. That’s a good indication of how teams value the position – even if the best team in the league (New England) does not. Just about any mock draft has a pair of defensive ends going in the top three or four picks. Ohio State’s Nick Bosa is thought to be the best player in the draft by many analysts, and Kentucky’s Josh Allen isn’t far behind. They could be joined in the top 10 by Mississippi State’s Montez Sweat and Michigan’s Rashan Gary. Allen and Sweat fall into the “EDGE” category, while Bosa and Gary are more classic defensive ends. Last year, there was only one defensive end chosen in the first round – Bradley Chubb at No. 5 overall to Denver. The only other defensive end to go in the first round was Marcus Davenport at No. 14 to New Orleans. That number will easily be topped this year. The Best: Nick Bosa, Ohio State. The little brother of Chargers star Joey Bosa, Nick was getting hyped as a potential Heisman Trophy candidate before the start of the 2018 season. A core muscle injury after just three games, however, ended his season. It hasn’t done much to hurt Bosa’s draft stock, though. He’s still viewed as a lock to go in the top three or four picks. Bosa backed up the hype before getting hurt, finishing those three games with 14 tackles, four sacks and a forced fumble. He was named the Big Ten Defensive Lineman of the Year in 2017 after finishing with 34 tackles (15 of which went for losses) and eight sacks even though he started just four of 14 games played. Bills View: Defensive end figures to be a big-time consideration for Brandon Beane at No. 9 overall in the first round. The Bills need to beef up their pass rush, and the position has plenty of question marks in the not-too-distant future. Both Jerry Hughes and Shaq Lawson are heading into the final year of their contracts in 2019, provided the Bills don’t exercise their fifth-year option on Lawson’s contract. That decision has to be made shortly after the draft. Perhaps it will be influenced by what happens there. Hughes, meanwhile, will be 31 this season. Do the Bills want to commit big money to a player on the wrong side of 30? The Bills also return Trent Murphy at the position, but with a nearly $9 million salary cap charge in 2020, he needs a big season to remain on the roster. Lawson, Hughes and Murphy combined for 15 sacks in 2018. Sacks aren’t the only part of a defensive end’s job, but the Bills undoubtedly would like to see that number increase. If the Bills were to use their first-round draft pick on a defensive end this year, it would seemingly guarantee at least one of Lawson, Hughes or Murphy would not be back in 2020. Combine freak: Montez Sweat ran the 40-yard dash in 4.41 seconds at the NFL Scouting Combine. He’s 6-foot-6 and 260 pounds. That should not be possible. Sweat is more than just a combine all-star, however. He’s a two-time All-SEC first-team selection – impressive for the best conference in college football – and was a second-team All-American in 2018 after finishing with 53 tackles (including 14 for losses) and 11.5 sacks. Scouts want to see Sweat get stronger, but that should come in an NFL weight-training program. Sleeper: Maxx Crosby, Eastern Michigan. He won the Mid-American Conference Most Valuable Defensive Player of the Year as a redshirt sophomore in 2017, finishing with 57 tackles (including 16 for losses), 11 sacks and four forced fumbles. He repeated as an All-MAC first-team pick in 2018 when his numbers shot up to 70 tackles (including 19 for losses), 7.5 sacks, four passes defensed and four forced fumbles. The Bills have had Crosby in for a pre-draft visit. 1. Nick Bosa*, Ohio State, 6-foot-4, 266 pounds. The Bosa bloodlines are no joke – Nick’s brother Joey is a Chargers star, and their dad, John, is a former first-round pick. 2. Rashan Gary*, Michigan, 6-foot-4, 277 pounds. The top recruit in the Class of 2016, scouts believe Gary didn’t reach is true potential at Michigan. 3. Montez Sweat, Mississippi State, 6-foot-6, 260 pounds. Sweat will have to explain to scouts why he was suspended at Michigan State before eventually transferring. 4. Clelin Ferrell*, Clemson, 6-foot-4, 264 pounds. A complete player who can defend both the run and pass, there is some question about Ferrell’s burst off the snap. 5. L.J. Collier, TCU, 6-foot-2, 283 pounds. He played just one season as a full-time starter, but impressed at the Senior Bowl. Scouts love his toughness. 6. Zach Allen, Boston College, 6-foot-4, 281 pounds. Allen might move inside on passing downs, but should excel against the run on early downs. Does he have enough juice as a pass rusher? 7. Joe Jackson*, Miami (Fla.), 6-foot-4, 275 pounds. A three-sport star in high school, Jackson stayed in South Florida to play for the hometown Hurricanes. 8. Anthony Nelson*, Iowa, 6-foot-7, 271 pounds. Had 9.5 sacks as a redshirt junior in 2018. Originally committed to Iowa State before a late scholarship offer from Iowa. 9. Kingsley Keke, Texas A&M, 6-foot-3, 288 pounds. Keke has dropped 20 pounds to make a position switch from defensive tackle to end. 10. Austin Bryant, Clemson, 6-foot-4, 271 pounds. Bryant uses is long arms (34 5/8 inches) to create pressure as a pass rusher.